I’m having trouble coming up with a replacement part necessary to bring my client’s Grundig 5399U/S back to life, so I turn to the Internet to help. Part of the band switch assembly is a rocker arm which spans the length of the chassis and allows the radio to switch between AM and FM. This piece of the mechanical linkage was made with very poor-quality metal on the Grundig 5399 radio and the part has degraded into dozens of tiny pieces which cannot be readily reassembled. If anyone reading this has, or knows where to locate, a Grundig 5399 rocker arm or pattern to recreate one please leave a comment and I’ll be in touch. Leave a message if you have any leads! Thanks. 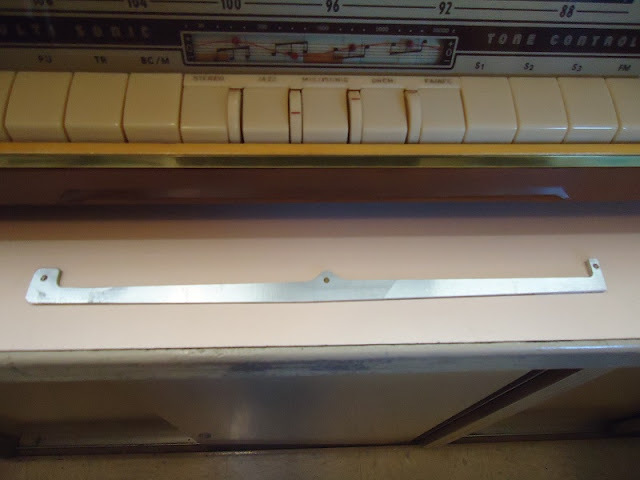 This entry was posted in Photos, Projects, Radios and Tubes, Vintage and tagged Band Switch Lever, buying, Grundig, Grundig 5399U/S, Grundig 8000, parts, Rocker Arm, wanted. Bookmark the permalink. Well, gluing it together with JB Weld didn’t work. Still looking for a solution. Did you ever find a rocker arm or get one fabricated? A friend is restoring a 5399 U/S also and his rocker arm is broken in 3 pieces but he is gluing it back together with JB Weld and some flat metal. Doesn’t know yet if it will work. Also did you ever get a schematic for the 5399? I’d love a copy if it isn’t too much trouble. You should put an ad in Antique Radio Classified magazine.